True Fan or Bandwagoner? In San Francisco it doesn’t matter. It has been over a week now since the Giants took the baseball world by surprise. In fact, for many die hard fans who have rooted for the team for at least more than a decade, it took them by surprise too. The shock is just wearing off. 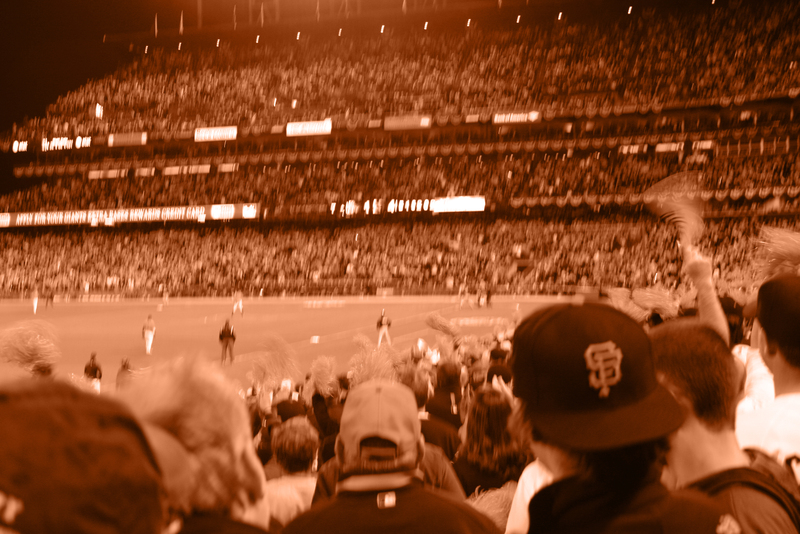 Having had the chance to bask in the orange glow of San Francisco’s first World Series Championship, everyone who has closely followed the Giants is now realizing the true impact of the accomplishment is bigger than a stadium filled with 35 thousand fans during the dog days of summer. The Giants parade was littered with converts (bandwagoners to those who sport Croix de Candlestick pins from the days of watching baseball in the ice cold winds of Candlestick Park. If you don’t know what a Croix is, good look it up). Converts who couldn’t name the whole starting lineup for the Giants. Converts who couldn’t tell you who are the 4 Giants greats with statues erected outside of AT&T Park. Converts who now own well over $100 worth of brand new Giants merchandise. Converts who know who Mark Zuckerberg is but not Bill Neukom, but that is okay. By the way, my 8 year old daughter can tell you all about the statues. A parade of champions is not the same as a Christmas Day parade or a New Year’s Day parade. Most parades are for people on the side to watch the spectacle of the parade. A parade of Champions is different. It is for, in this case, the Giants, to see how wide an effect they had on people. For them to see beyond the walls of the stadium. For them to see how crazy they made people. A chance for them to see all the crazy people they converted into fans. Their biggest public audience…..over 1.5 million people (estimated) lined the mile and a half route, the same route taken by Willie Mays and the Giants when they first arrived from New York. This was not a parade for one team. This was a parade for 53 teams and 53 years of long-suffering. One can only imagine what will happen when Chicago and Cleveland win their next World Series. During the stretch drive of the regular baseball season, my family and I sat in front of some elderly men and screaming high school girls. All the girls could talk about who was cuter, Buster Posey or Barry Zito. The men were questioning about having a rookie catcher was a mistake. My 8 year old daughter looked at me, ready to say something and I had to tell her that it was okay. “But they’re not REAL fans, Dad,” she said. I was proud of my daughter for her aptitude, but I was also glad to see more people enjoying the Giants. true, it was hard to listen to for a diehard fan during a pennant drive, but baseball can not live on die hard fans alone. If that were the case, AT&T Park would be empty. San Francisco is a melting pot. Being a San Francisco “native” is such a novelty. Only 37% of the residents are even born in California and 35.5% aren’t even born in the US. What shocked me even more is that in my son’s class recently 19 boys signed up for lacrosse while only 11 signed up for baseball which indicates where “America’s past time” sits with the families living in San Francisco. 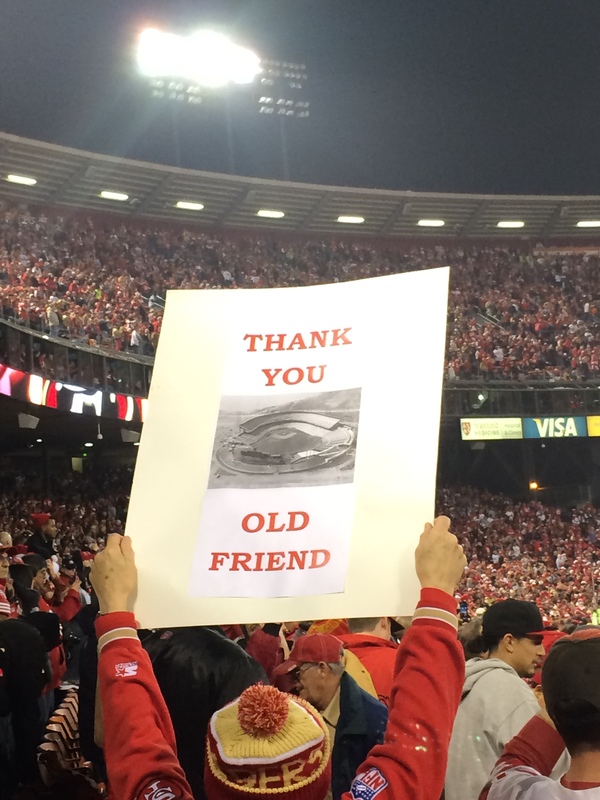 There are few legacy Giants fans in San Francisco. These 2010 Giants had to earn new fans and recruit them through more than a history lesson. They needed to tell their own story. And they did it the San Francisco way. In many ways they represented the city and its crazy mix of citizens. If you didn’t like the story of the hero old guy, the star young pitcher, or the wacky reliever, there was a human interest story somewhere on the roster that you could relate to. What was more important and maybe something we all could take a lesson or two from is that this was the right team to represent San Francisco and bring it it’s first World Series Championship. Like the 1981 49ers and the 1975 Warriors, each team that brought San Francisco its first championship in their respective sport was made up of underdogs. Each team did it as a team, with unsung heroes and a style that made them distinctive. The ’75 Warriors some consider to be the least talented team to win the NBA title, but they played like a team. The ’81 49ers showed the NFL that the “West Coast Offense” would bring a whole new schema to the game of football. Winning builds community and that is what all these teams did. The Giants have written the latest chapter and the city still is awash in orange a week later. People feel guilty still talking baseball when football and basketball are being played. It’s okay. At least we’re talking. Some satirists joked that the Giants parade was much bigger than the Gay Pride parades in San Francisco. 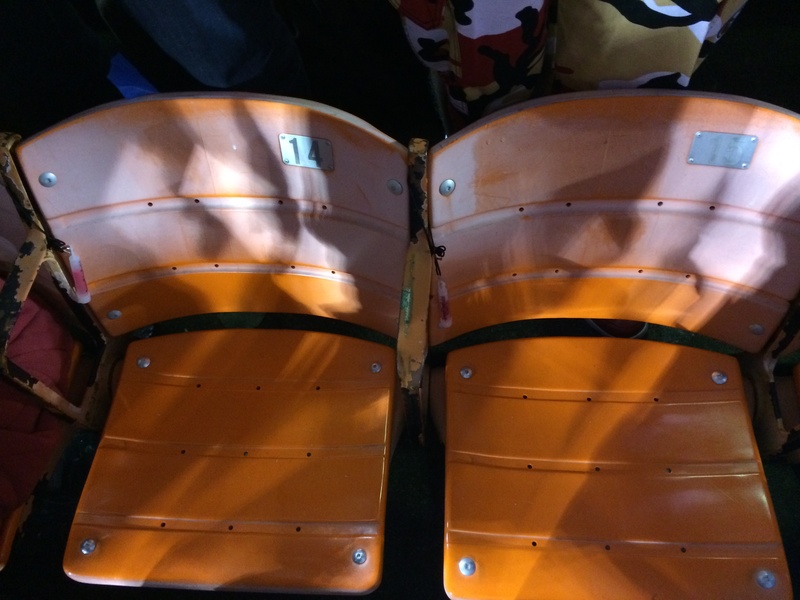 I think it just proved that San Francisco is a real baseball town. It proved that San Francisco has a way about doing things with style. Finally, it proved that teamwork breeds a great community atmosphere. Long time fans and bandwagoners partied equally hard, and partied together. In San Francisco we are known to be accepting of all types of people (except Dodger fans)..so welcome aboard the bandwagon. One of the more wonderful things I was happy about in 2009 was that I got out a few times with one of my best friends from childhood. We’ve started graying and maybe even have started to repeat ourselves so getting out again with each other and while we didn’t get to great events like a Super Bowl or a Cal-Stanford Big Game with miraculous plays, getting out and enjoying things together with someone and sharing in the joy, the laughter, the sadness, and the disappointment is what makes those events and memories even more special. Recently we went to a Monday Night Football game which I have to freely admit is not what it used to be from a television experience, but in a day and time when we see a lot of football played on Sundays, I had forgotten how special a night game in December could be. 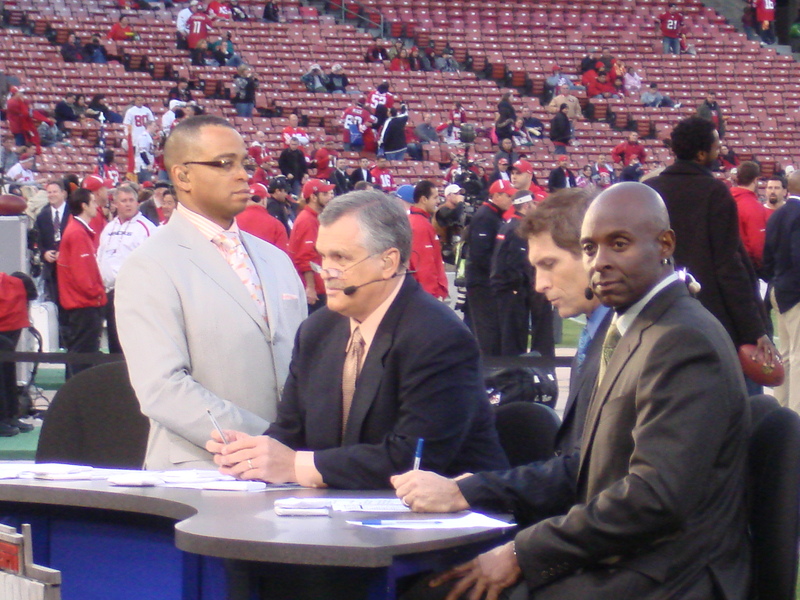 Granted the 49ers are no longer a dynasty and ESPN does not replicate ABC and Howard Cosell or John Madden, but it didn’t need to. Just sharing the night with a friend made a special night even more special. I’d forgotten how great and magical Monday Night Football could be. Even without the 49ers making the playoffs for the 7th straight season, the stars were still out. The cool thing about Monday Night Football is that it is just as big a sporting event as it is a media event. The sports celebrities are as big as the players themselves. 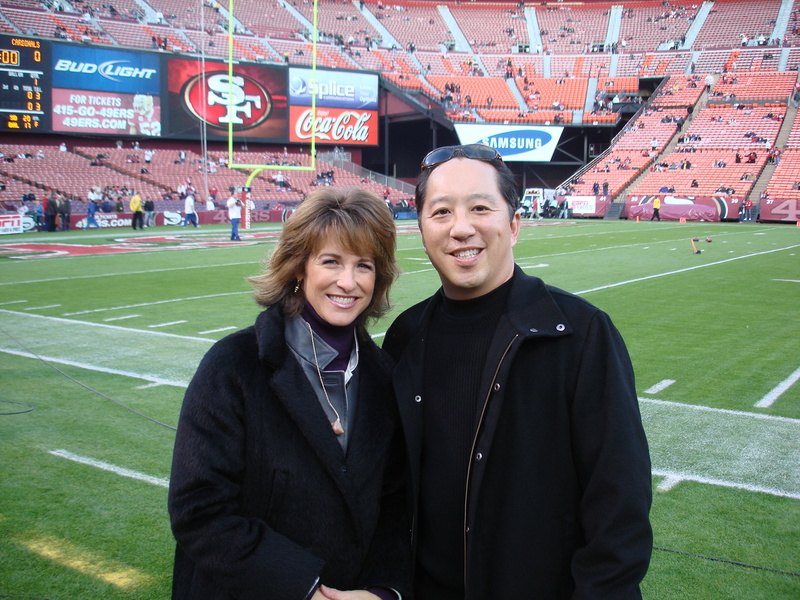 ESPN personalities like Suzy Kolber, Michelle Tafoya, Stuart Scott and Matt Millen were all in attendance on the sidelines. As a football fan though, the game was very entertaining as the 49ers beat the defending NFC champs, Arizona Cardinals for the second time this season as they hounded them for 7 turnovers. More importantly, the game ended with more memories for a good friendship that will leave us with more moments that we will be able to acknowledge with a simple nod and a smile because of its uniqueness in both of our memories. From my perspective, taking photos of my friend both with the owner of the team as well as the 49er cheerleaders cracked me up. Hopefully 20 years from now we’ll look back and them and crack up at how silly we were. They will go in the pile along with the Polaroids (Wait, is it still 2009? No? Time to throw away the polaroids.) we took with Miss Universe 1982, Shawn Weatherly (yes, I still have old polaroids.) 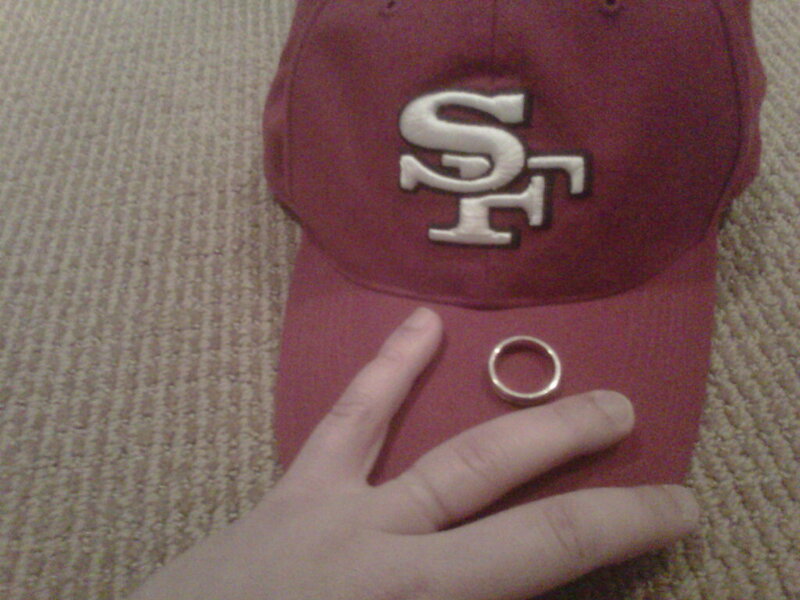 In fact it was 1982 when the 49ers were bringing hoe their first Super Bowl (1981 actually). Maybe it is coincidence that I went to the game with my friend Dave. 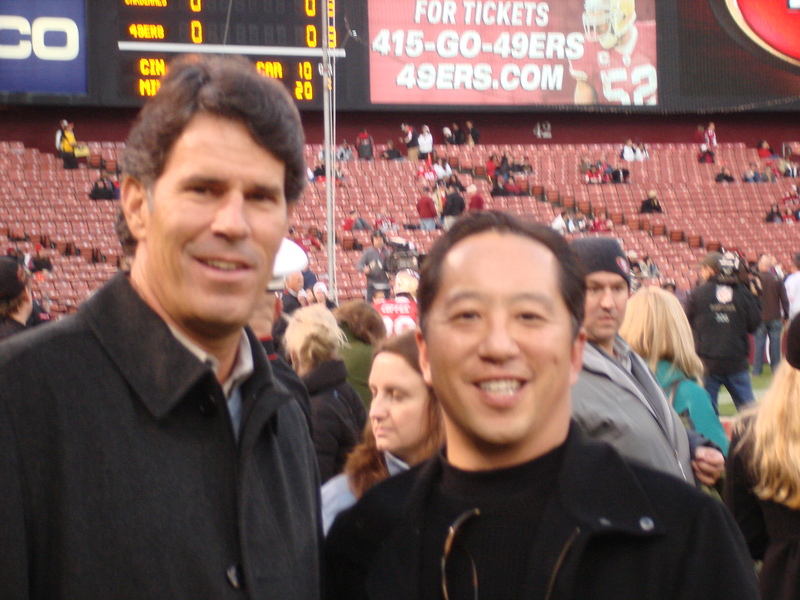 It has been a while since the 49ers had a winning season (they’ve not had a winning season since 2002), so this turnaround is a great time to share with friends. leads to faith, friendship, and hope. In the movie, the reclusive author rediscovers the joy of visiting Yankee Stadium and a Knicks game at Madison Square Garden with his new-found friend. This game was just a way for my friend and I to revisit some of those great memories and it just so happens that many of the heroes of our past were there. 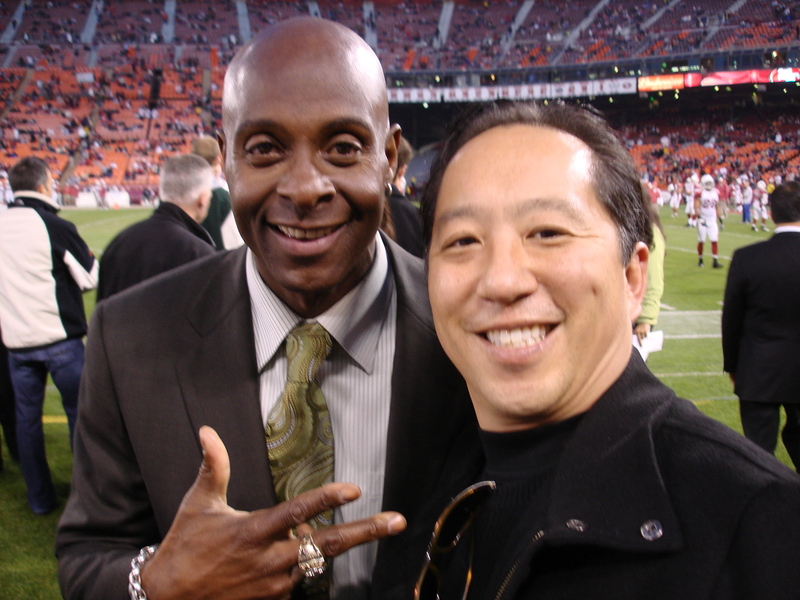 Seeing Jerry Rice, Steve Young, Steve Bono, Matt Millen and Keena Turner on the sidelines while watching an increasingly competitive 49er team play a game on Monday night brought back many fond memories and good times. It should be said that fiendships are not only there for the good times. And that is why as we head into 2010 that I can only hope that many of the friendships of 2009 that were rooted in some not so fond times will get to rekindle some good times in 2010. Been a bit since I posted thoughts here. A lot has been going on in life so it is good to capture these thoughts now. I have been inundated with life events that have put me in a very pensive mood about what where I’ve been, where I am and where I am going in life. After these last two weeks, today is defintiely a Brand New Day. When I arrived home yesterday I saw the biggest smile on my wife’s face. To be welcomed by a big kiss a day after coming home to find that I lost a close relative to a heart attack was definitely a good pick me up. This may be the beginning of a brand new day on our journey with cancer. My wife’s joy was from her follow up post-op appointment with her surgeon. I think her doctors were also relieved to see her smiling as well as she said that they all gave her big hugs. Yes, my wife was her usual “chatty Cathy” self again, and that meant all was really well. It just dawned on me that it had been over 18 months since I had seen that excitement on her face. I had missed her “text” message in which she had told me how happy she was. She had been in good spirits, mind you, but this was just different. Some say our journey of survivorship is over, but I think when we look back it has only just begun. One of the things that I didn’t know would affect me so much is the way Breast Cancer Awareness has grown so much. Last year when my wife was just starting her battle we might have missed all of the action, but this year we both seem to be more aware of how powerful a movement Breast Cancer Awareness month really is. I felt like every week there was a walk or run for breast cancer and I did notice a lot of products in the grocery store when purchased gave back to some breast cancer research fund. For example, Ingrid Michaelson, pictured above, sang at a local club last night here in San Francisco with proceed donations at the door going to Breast Cancer Organizations in the Bay Area. The song “Be Okay” has become a feature song in the fight against breast cancer. She was also part of the Hotel Cafe Tour last year in which the album, Winter Songs, gave $.50 for each sale to breast cancer research. This past weekend, all of the NFL paid homage to breast cancer and its survivors. At the 49er game, donations were taken at the gate, referees wore pink, cheerleaders wore pink and players wore pink. Before the game, 50 breast cancer survivors were introduced to the players. One of the captains, 49ers QB, Shaun Hill, who wore pink cleats during the game, met with the survivors. He was later quoted as saying how he had put on the pink cleats without thinking. He didn’t know anyone with breast cancer, but when he met these women and saw the spirit in their eyes he said it suddenly became real to him and the shoes meant something. He said it even rattled him a bit before the game started. And just yesterday I was at the President’s Cup. Nothing formal was done around Breast Cancer Awareness but a couple of the US players, notably Phil Mickelson and Master’s Champion, Zach Johnson, wore pink ribbons. Phil’s wife Amy, a native of Northern California, is currently battling breast cancer. What was readily apparent was that Phil made a point of saying hello and stopping for a second to speak with every person who wore a notably pink cap or ribbon to stop and sign an autograph. Several elderly women who wore Susan G. Komen shirts were startled as he stopped to say hello and give them each a hug. It didn’t go unnoticed by me or any of the thousands of spectators who saw this connection and warmth he exhibited especially when compared to other golfers who whisked right by the crowd without any kind of acknowledgement to the screaming fans. So what does this mean? To me it is just the sign of how powerful a community of similarity around a single cause can be. I wish the same thing could be done around heart disease. Just like the push for a mammogram, perhaps everyone should get an EKG. With the obese population we have and the number of people who die of heart attacks each year, why shouldn’t we all get one. I probably need one and my cousin who passed away in his early 50s in his sleep earlier this week could have used one. I bet his 3 teenage children and wife wish that he could have had one. These events when they hit so close to home just make me think more about my life in so many ways. What was the last thing I did with my cousin? Gave him a High-5 and a hug at the 49ers home opener. How good does that make me feel? It helps me feel like my peace with my cousin is there. It reminded me that when you see someone make sure you leave a good impression with them until you see them again and to remember that smile until the next time you see them. My cousin and his wife and family are models to me of where I will be in 10 years. I can’t help but see that in 10 years I don’t want my heart to fail on my own children and leave them fatherless as they just get started with their lives. It is sad though. My cousin was my 10 year barometer in life. His death to me is a kick start to remind myself to do as much as I can to spend quality time with my children and really make sure they know me and my wishes for them. My life is an open book to them. No secrets. My fears and hopes and dreams are there for them to inspect. My cousin and his wife were the first people we told on my father’s side of the family when my wife was diagnosed with breast cancer last year and they were the first to help out. My wife and I are beside ourselves about how lucky and fortunate we are to be winning the battle against breast cancer a year later at the same time we are seeing people who seemed so healthy leave us behind. There is no rhyme or reason it seems. Finally, my son’s classmate’s dad finally lost his battle with pancreatic cancer earlier this week as well. Yes I feel like signs of my life area ll around me. Watching another dad with similar age children leave behind a wife to take care of a 10 and 7 year old is just so sad. When first diagnosed he told me how his main goal was to fight the cancer as long as he could but he knew he couldn’t win in the long run and thus his other goal was to impart enough of his thoughts on life to his two sons so that they’d have something to guide them. Watching the 10 year old this week, his father did a good job in preparing him for the inevitable day. Sad that it has to be at such a young age though for such a good kid. So where do I go from here? As I said, it’s a brand new day. We can only go forward, live life to it’s fullest and make sure we taste every experience we can get and share it with everyone in such a way that we have an impact on those who might have to be reminded or forget the power of the human spirit. This is now the time to enjoy its 40 hills, its 49 square mile (some say its officially47) and some of its over 3000 wonderful restaurants. Tourists are gone, the weather is at its best, and if you want to venture up to the Napa wine country, it is time to see the Fall crush of the grapes which many say is the best time to visit. Someone asked me recently, “What is with the midnight runs?” They really aren’t at midnight, but I have to admit they are later than most people run. They are also somewhat of a sore point with my wife as she doesn’t like my running in dark clothes with no identification on me. The truth of the matter is that while I am running sparsely populated streets at night, I do run a pretty regular route, I run on sidewalks and even some of the parking valets around know my schedule well enough to tell me if I’m running late, early or slow. Last night I was even able to tell the valets at Spruce Restaurant the score of the late night ESPN game. Running the streets of San Francisco is where I do my best thinking. Sometimes those nagging issues you’ve been dealing with for days or weeks just somehow find a solution at mile #2 when you’ve got that lactic acid building in your leg, but you stretch it out running up the steep incline on Upper Fillmore imagining you are Rocky only to find Gino’s liquor store and the last patrons of Jackson Fillmore coming out of the trattoria with sated appetites instead of a big statue at the top of the stairs overlooking Philadelphia. It is my favorite time to run in San Franciso. The end of summer in San Francisco usually means our hottest days are coming. It means nights filled with low lying wispy fog that drenches your face during your runs. It also means those deep fog horns blaring throughout the night. During the day the fog blows out to sea and the days are filled with 80 degree weather. My dad used to call this fog, San Francisco’s natural air conditioner. It is so refreshing and almost is like our Spring in many ways. 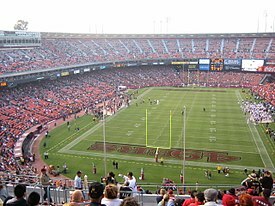 In fact with baseball season ending and football season beginning, it is like a whole new season, especially in San Francisco, home of the 5 time champion 49ers. Growing up going to games with my dad it was the time of hope and new beginnings. To me it still is that way. Now it’s with my own son. Running the streets of San Francisco, with foghorns blaring I just smile to myself thinking about the great time I had at the ballpark with my son earlier in the day, introducing him to the people who have sat around us in the same seats for 30 years. The same people who gave me cookies and milk when I was his age now give them to my son. My son has no clue how he’s just living my life from 30 years ago. Cheering on the 49ers, high fiving strangers after a great play and eating terrible food that give you a stomach ache when you get home. It’s a cyclical pattern in life and yet it is a new beginning. I can look back 30 years, but these days while I celebrate a year since my wife’s breast cancer surgery, I also look back a year when I was playing nurse to my recovering wife. It still isn’t over with her pending surgery coming. This will again hopefully be the last surgery for a while. This is one cycle I don’t want to have repeat itself. A year can make a huge difference both good and bad. There is no doubt in my mind that my wife and I are stronger than we were before. So back to my running, I’m not an extremely spiritual person as I’ll go to church for special occasions, but running has been my place of worship and my confessional. Each run is my own search for the truth. I don’t run with others, justw ith my thoughts. It is where I ask myself if I truly believe. It is where I push myself and question my actions and where I look for the answer to many of life’s questions. It is my solitude that allow me to begin a new day every day with renewed energy. There is a running commercial where the person has to get through that first mile before they reach that special runner’s place. Yes, that the runner’s high. It is true for me like many. I feel better after an exhausting run that before I left. San Francisco has a part in that. It is that friend that is with me on every run. Its streets are the paths in life that I go over time and again. Yes Fall is here in San Francisco and my motivation is higher than ever.